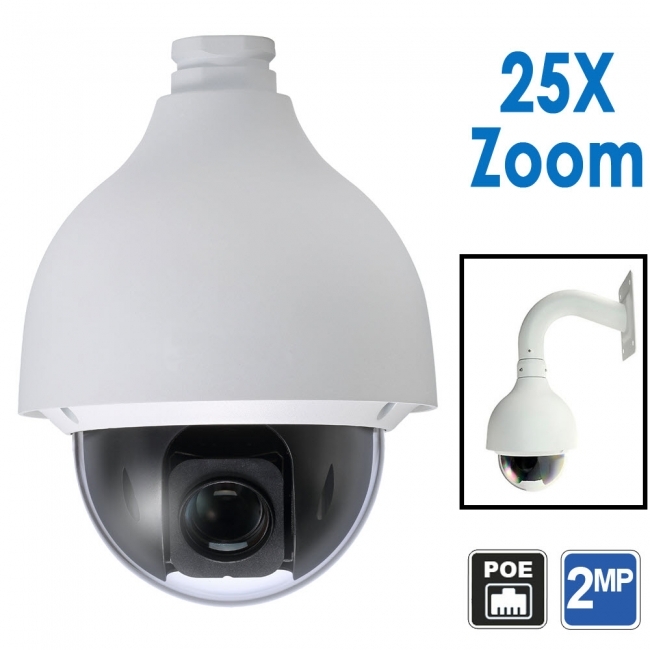 This 25X Zoom Network PTZ Camera is part of our latest generation of IP PTZ Cameras with professional features not found on consumer or economy level equipment. You can find a list of these features in the list below in bold. This Pan Tilt Zoom camera has a 2MP SONY Starvis CMOS sensor plus Starlight Technology which make the camera have excellent low light performance down to 0.005 Lux in Color mode and 0.0005 Lux in Black and White. This very low Lux performance allows the camera to see in very low light with clarity, and without the need for IR. Ambient light or moonlight works wonders for this camera. Without having infrared LEDs that are shining, it can be used as a discrete camera for night time surveillance for perimeter security without alerting the intruder of the camera's presence. The 2MP Sony Image Sensor produces clear crisp color video in 1080P Full HD, beating the cheap sensors found in low cost cameras. This camera allows the user to record up to 60fps at 1080P, which is high speed frame rate recording for fast moving capture. It has a 4.8-120mm Optical Zoom Lens that allows the user to zoom the camera in and set it for subject identification up to 300ft away in daylight. If you have the camera set at a wider angle of view, the 1080P resolution allows digital zoom up to 25ft away from the focal point for facial identification. Depending on how you set the camera's optical zoom, you will get different max distances for facial capture. This camera also has Auto Tracking which can be programmed to have the camera follow people and vehicles. Auto tracking is best for long range scenarios and not for close range capture. Controlling the camera is simple. You can use a web browser, our mobile app or Windows/Mac client software, or you can control from the NVR using a mouse. If you would like to control using a joystick controller, you will need our network PTZ camera controller. How do you view and record this camera? This is an IP camera and works on a computer network. You run its signal back to your network or your NVR over a CAT5 network cable. If you don't want to simply use this for viewing or record only to an internal microSD, you can view and manage the camera by using a web browser. You can even use our mobile apps to view from an iOS or Android device, or use our client software for Windows/Mac. If you would like to record video as part of a security camera system, please make sure you use a NVR, Tribrid or Pentabrid DVR, or PC Software to record the video stream from the camera. When shopping for the optical zoom capability of a PTZ camera you should look at the actual specification of the zoom lens and not the zoom power stated as a number with X. This camera has a 4.8mm to 120mm Lens. If you divide 120mm by 4.8mm you get a zoom power of 25X from the starting position of the lens. Compare that to many 30X PTZ cameras on the market which have a 3.6mm to 110mm Lens. 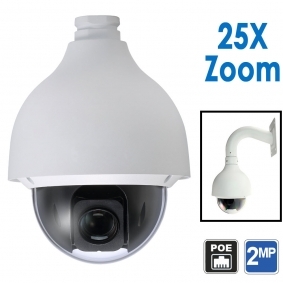 110mm is less than 120mm, which means that this 25X PTZ Camera can see farther. This is where weeding through marketing hype is very important to make an informed purchasing decision. Can connect this device from 1000 meter distance using cat 5? Or suggest me other way to solve it. You will need to use fiber to achieve that, and provide power locally at the camera location. Can this product connect wirelessly to the router? It can be made wireles if you use a wireless access point. Here is a link to a wireless setup guide. Hello, Will this camera connect to a Dahua NVR? Also, in configuring the menus in the camera, is the language English? Yes it can, and it has English menus only. Just to be sure, provide the model number of the DVR you have to ensure compatibility before making a purchase.